GinohnNews: A Holiday for John! Last week, I announced on this page that we've decided to sell our house and move, away from the DC area, probably to Guelph, a town in Ontario, Canada, in about a year. You might expect a bombshell like that to generate some reactions, and it did. We got quite a few emails on the subject, and the discussions on the Something email list might be considered a minor Flame War. No one really questioned our decision to move away from DC, but a lot of folks were upset by our plans to leave the USA. Leaving the country, we are told, would be quitting, giving up, running away, and turning our backs on a struggle we need to be a part of. I said last week that there were 2 upcoming events that will sway our final decision. The first is the presidential election, but actually, the real issue is the pending Supreme Court ruling on medical marijuana. Even if Bush wins, we would decide to stay in the USA if the Supreme Court declares marijuana prohibition unconstitutional. Such a ruling would change everything overnight, and at that point, we'd be happy to stay in the States. However, if the Supreme Court upholds federal prosecution of pot-smokers, even those who grow their own and who do so for vital medical reasons, and in a state where the voters legalized such actions 8 years ago, then we're leaving. Period. That ruling would be such a crushing defeat for us that we just won't want to stay in this country any longer. If the Supreme Court upholds total prohibition, it will give the drug warriors a mandate that will leave us feeling unsafe anywhere in America. Even as the eternal optimist that I am, I harbor no illusions that Congress or the President (even if it is Kerry) will do anything about ending the Drug War any time soon. Our only hope for a near-term victory is for the highest court in the land to strike down these unjust laws with a Roe vs. Wade-level decision, and after years of waiting for them to accept a case that would give them an opportunity to make such a ruling, a really promising case is now finally on their docket. No matter which way it goes, I believe this ruling will be pivotal. Either it will open the door to personal freedom, or it will slam that door shut for the next 5, 10, 20 years, or more. If the Supreme Court refuses to reign in the drug war, it will give the DEA even more power. I remain shocked by the actions the DEA has taken in recent years... but can you imagine how much more aggressive they'll become if the Justices let them get away with everything they've done so far? It's just like the bumper sticker says: I Love My Country, But I Fear My Government. If the Supreme Court lets marijuana prohibition stand, then we're gonna have to get out of here. If you want to call us quitters for it, fine. But we're tired of living in a country where we have to worry night and day that DEA agents with assault rifles might break down our front door. We're tired of being oppressed citizens, and if the drug warriors get any more powerful, we might face arrest simply for speaking out on this website as we've been doing for the past 7 years. Some see our moving to Canada as running away from the battlefield of our activism, asserting that our voices will be heard less and taken less seriously here after we move away. We say instead that we will be retreating from deep within enemy territory in order to join the battle on the frontlines. I have a dream. I dream of an America where cannabis consumers are as free to enjoy their drug of choice as are cigarette smokers and alcohol drinkers. I dream of an America where pot-smokers no longer live in perpetual fear of having their lives ruined by the police, because the cops only chase actual criminals. I dream of an America where the stoners pay sales tax, where the dealers they buy from pay income tax, and where no one gets murdered or imprisoned because of a plant. I dream of an America where Amsterdam-style coffeeshops peacefully co-exist with bars, casinos, fireworks stands, and adult bookstores. Ultimately, I dream of opening a gaming-themed cannabis cafe of my own. I see the coming legalization of marijuana as a tremendous business opportunity. As both a visionary and an entrepreneur, I can see the changes coming, and I want to get in on the ground floor when those changes finally occur. I truly believe it will be possible within our lifetimes to create American coffeeshops, and being an entrepreneur, I want to be among the first ones doing it, once it becomes feasible. I believe it is inevitable that it will someday be legal to grow and sell marijuana here in America. Until then, we refuse to take the risk of growing anything ourselves. In fact, the only time I've ever even SEEN a live cannabis plant was while I was in Amsterdam. Alison has a Master's degree in Horticulture, and we'd love to be able to turn her loose in a marijuana garden, but the risks here and now are way too great. However, that will someday change, and even though we currently have absolutely no experience with the growing of pot, we fully intend to open a commercial pot-growing business just as soon as the laws will allow it. We'll call it Alison's Happy Flowers, and it'll be like a micro brewery for cannabis enthusiasts. But even if I'm right about the pending Supreme Court ruling, the idea of a commercial marijuana grow-op is still a distant dream -- at least in America. The most favorable ruling I could imagine would only permit direct consumption of that which you grow yourself; it wouldn't allow commercial sales, as those would still fall into the category of "commerce." Congress would still need to legalize sales in order for us to launch Alison's Happy Flowers. But they're way ahead of us in Canada. As I reported last July, Toronto already has a "smoke-easy" style coffeeshop, where open consumption of marijuana is being tolerated, and in Vancouver, cannabis cafes are starting to get away with the actual selling of smokables. I expect that legitimate commercial cannabis operations will be possible in Canada a lot sooner than here in the States, which is why were so keen on going to Canada. Sometimes you've got to move if you want to be in the right place at the right time. Even if we do go to Canada, we aren't planning to renounce our US citizenship. Looney Labs will remain a US-based corporation (our Canadian location would simply be the Creative Management Office), and we will travel back to America frequently. Our warehouse and fulfillment partner (a company in Lorton, VA called PMC (formerly known as ACMS)) will continue to store and ship our products for us. We will continue to attend all the usual conventions we go to now. (In some cases, it will actually be a shorter drive!) Those who know us only from our games, our webzine, and our public appearances will still have just as much contact with us as before. Canada isn't that far away, after all. We will still be in North America. And maybe we won't stay in Canada forever. I believe Canada will legalize first, and when that happens, it will be a major turning point in the attitudes down here. Eventually, the laws will change in America too, and at that point, if we haven't settled in too deeply, we might move back. It might not even take that long. Maybe we'll have the grand adventure of living abroad for a year, or 4 years, and then we'll return. Nothing is set in stone... this is about expanding our options, not narrowing them. Even if Kerry wins, we plan to move to Canada if the Supremes uphold prohibition. But if they legalize personal use (and given the way the case will be argued, I don't think they can only legalize doctor-approved use) we'll probably re-think Canada, even if Bush does win. The idea of moving to New Hampshire and signing on with the Free State Project is undeniably appealing... but pointless to us as long as federal drug laws are allowed to trump state laws. In closing, let me say something I should have said last week: I love the United States of America. Current management aside, I think we have a great country here and I'm glad to be an American. (If you haven't seen it yet, check out Early American Chrononauts; I think it's a testament to my patriotism.) But I'm also a citizen of the Earth, and I've often fantasized about living some portion of my life in another part of this huge and fascinating world, if for no other reason than for the experience itself. Just because I love America doesn't mean life in another country isn't also appealing, and living elsewhere won't stop me from visiting frequently and paying attention from afar to what's going on at home. I'll even continue to vote, in all applicable elections, and I'll always consider myself an American. In many ways, I'd prefer to stay in the good old USA. But at this point, the decision is up to the Supreme Court. If they endorse the war on medical marijuana users, we will no longer feel safe in this country, and no appealing to national pride will change that. Here's hoping the Supreme Court has the guts to uphold the Constitution and declare an end to the war on pot-smokers! 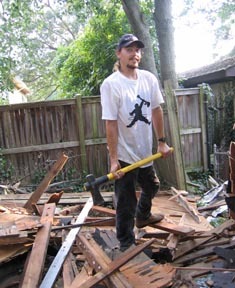 Regarding this week's cover photo, it's a picture of Kevin (Marlene's sweetie) demolishing our shed. It's OK, we wanted him to do it. In fact, we're paying him to! He just got laid off ("The economy is growing." Right.) and we're helping him stay employed while he looks for another job. For years we've been wanting to tear down the dilapidated old shed in our backyard, and to tear out the crumbling patio in front of it, and replace it all with nice, grassy lawn. And Kevin is on the job! Also, see that tree, leaning to the left in the photo? It's growing in a crack in the pavement where the patio meets the shed's foundation, and this tree has slowly been doing the job that Kevin is now finishing up. 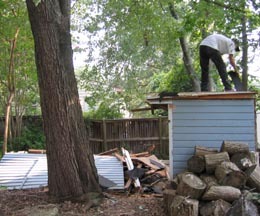 The only sad thing about all this progress is that we're also cutting down that big old tree which finally saw victory over the shed. For years we've also been worrying that this tree, which leans right over our living room, might someday fall onto our living room, and we're worried that removal of the concrete which the tree has also been destroying will destabilize the tree's root system and make it seem even more likely to fall on our house. So, along with everything else, we're having Kevin take down the worrisome leaning tree. We will be sad to see this tree go... but getting rid of it is a difficult-but-wise decision which is easier made now that we're planning to move. "The publishers of The Iconoclast endorsed Bush four years ago, based on the things he promised, not on this smoke-screened agenda. Today, we are endorsing his opponent, John Kerry, based not only on the things that Bush has delivered, but also on the vision of a return to normality that Kerry says our country needs. Four items trouble us the most about the Bush administration: his initiatives to disable the Social Security system, the deteriorating state of the American economy, a dangerous shift away from the basic freedoms established by our founding fathers, and his continuous mistakes regarding terrorism and Iraq." -- The Lone Star Iconoclast, "Kerry Will Restore American Dignity"
"Perhaps it was not by chance that it was a woman who asked the president, at the town hall debate last Friday, to list three instances in which he had made wrong decisions since taking office. If women react to Mr. Bush's made-no-mistake tactic the way they react to it when it is used by men in their lives, a majority may well be more angered than reassured. That's because it drives many women nuts when men won't say they made a mistake and apologize if they do something wrong. I'm reminded of a woman who was angry at her husband because she had given him an important letter to mail and he'd assured her he'd mail it, then told her the next day, 'I forgot to mail your letter,' and stopped there. She waited in vain for the sentence to continue, 'I'm sorry.' In the end, she was angry not about the letter but about the missing apology." -- Deborah Tannen, "Being President Means Never Having to Say He's Sorry"